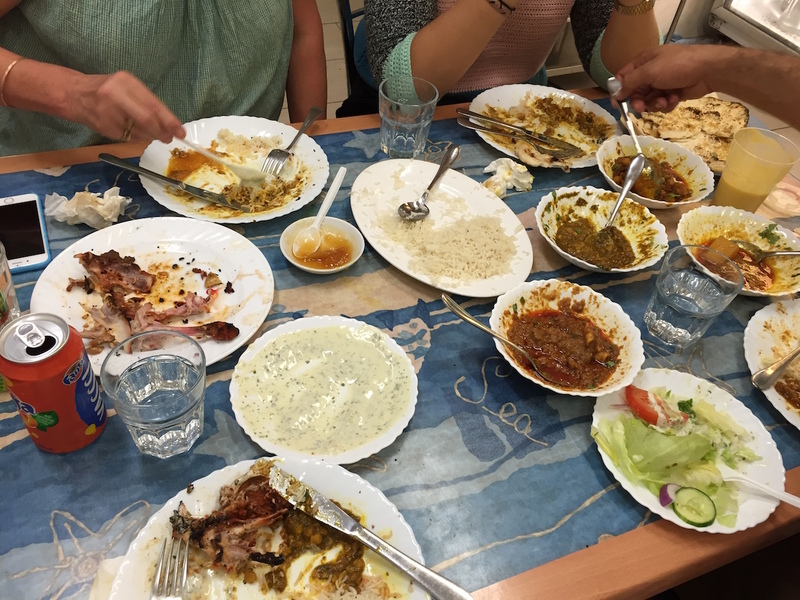 Everybody was all like “Ooh, ooh, I want to come to Faheem’s,” which suited us because more people means more dishes to try. But then of course it was all, “I can’t do Friday…” and “… they’ve changed the roster…” and “…they changed it back again…” then there was, “…this bug is going around the school…” and of course “…jetlagged.” So it was a bit of an easter miracle that four of us were able to synchronise our schedules and home in on Enmore Road on Saturday night. The final make up of the party was Strop and me, with the Stropolina and her new beau, the Lifesaver, so at least there were enough of us to seriously over order without looking too greedy. Faheem Fast Food is a bit of an urban legend around our area. 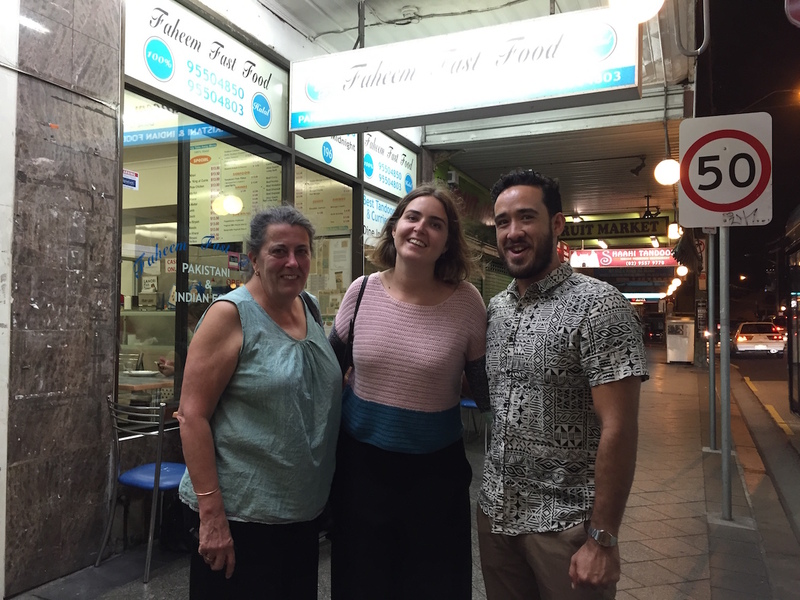 Its fluoro lighting, tiled walls, and no-nonsense tables have been greeting taxi drivers, families and hipsters since… well, for a very long time. They serve up splendid Pakistani and Indian dishes in a very timely manner, so much so that it has restored my faith in nominative determinism. Our first stop though, was a little bar called Midnight Special, because Faheem might be fast but he is not licensed. 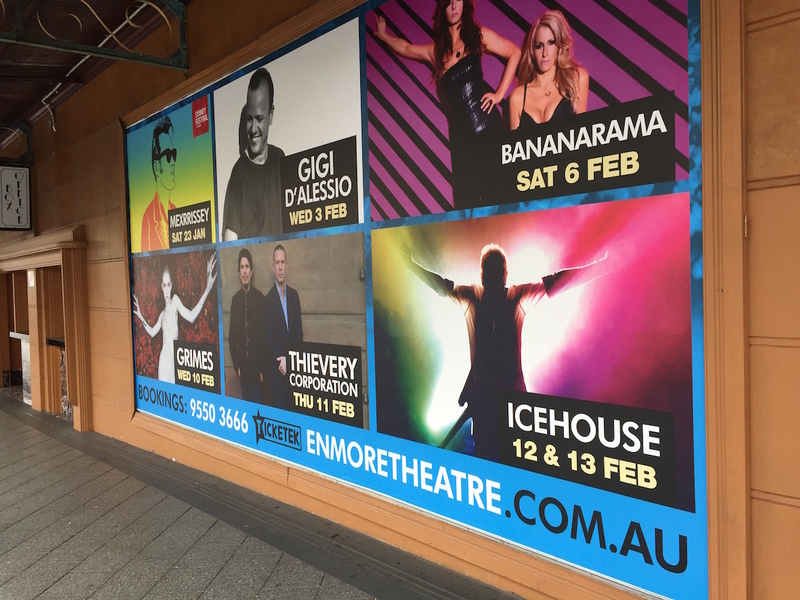 Strop and I stopped here last Tuesday before going on to see the wonderful Tedeschi Trucks Band at the Enmore Theatre. As well as good beers and an excellent blues soundtrack, they were offering bao buns with a variety of protein based fillings. I thought that the pulled pork with lots of Asian flavours was particularly yummy, but Strop compared the actual bao bun as being a bit like a thong. Which led to a brief moment of confusion until she clarified that she was referring to footwear. On Saturday night the place was a lot more crowded and the soundtrack a lot less interesting (70s/80s hits and misses — all filler, no thriller). We had our one drink and toddled on up the road to Faheem’s with the soundtrack now changed to the Stropolina going “I want to go to that one… and that one too, ooh look at that, it too.” Good that she is so loyal to the family enterprise. I’m not sure what the Lifesaver made of it all, especially when we tried to explain to him the concept of rating accessibility according to the Susan Scale. 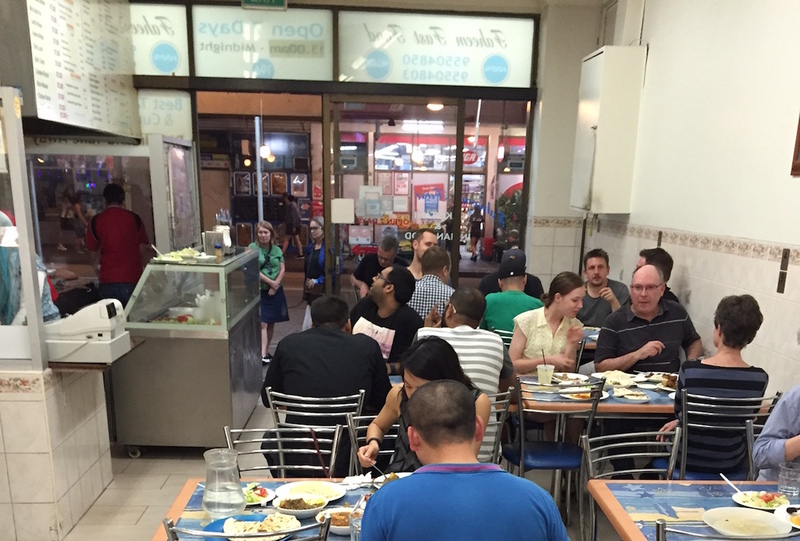 He was able to point out the best late night kebab spots on Enmore Road though, so he is already proving his worth. We were seated at the back of Faheem’s, just outside the kitchen, and conveniently close to the help-yourself-to-drinks fridge. 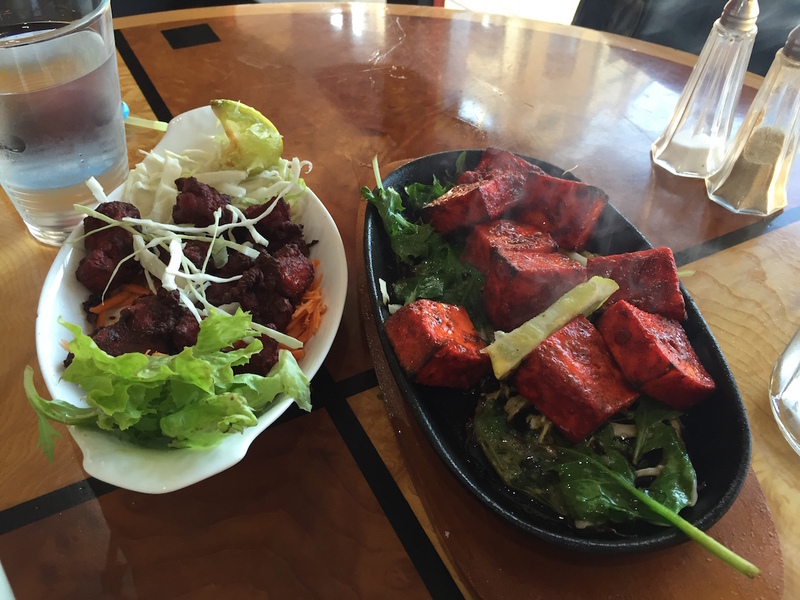 My only stipulation on the ordering front was that we had to have something from the tandoor. Strop and the Stropolina handled the rest of it. In no time at all a splendid spread was laid out in front of us. A whole bright-orange-with-black-charcoaly-bits tandoori chicken, was quickly followed by, dahl, chick peas, a goat korma masala, aloo gosht, and of course, garlic naan. It. Was. All. Excellent – although the Stropolina did think that there was too much “flubboodha” in the goat. This is her term for any animal-based food that is not meat. She has a very low tolerance for discrete bits of fat, gristle or any kind of connective tissue. We have learned to make allowances as she has so many other redeeming features. Faheem provides a no-frills service. Help yourself to soft drinks, lassi, or chilled water from the fridge. The glasses are just as likely to be hot, coming straight from the dishwasher, but at least the water is cold. It is relaxed, cheerful, and extremely tasty. You need to go. Now. Accessibility: 5/5 Susans – and there is a carpark out the back. Value? Up there I’d say, 4/5 Wendys. Salt? Didn’t notice, so I guess that is 5/5 Debs. Midnight Special though, deserves a special accessibility mention. The toilets are up three stairs, which means 0/5 Susans for them. Next up might be a Portuguese Chicken joint, I’ll have to check and get back to you. Back at the end of February, Strop and I took ourselves off to Hobart for a long weekend as part of our wedding anniversary celebration. The main motivation for going to Hobart was that we were getting sick of being asked if we had been to the Museum of Old and New Art (MONA) yet, and having to shake our heads sadly while we were told “Oh, you must go, it’s” [choose from the following list: “amazing”; “wonderful”; “different”; or “well, I’ll let you make up your own mind, but you must go”]. So eventually we did, and with the anniversary as an excuse we splurged on the fancy boat tickets to MONA and a nice dinner afterwards at a newish restaurant overlooking the harbour. We started our Big Day in Hobart with a trip to the edge of the bush for a breakfast date with old friends of Strop’s, Bob, Fran, Isla and Charlie. We spent a wonderful couple of hours eating excellent pancakes in their newly extended home, enjoying the view of Mt Wellington through an enormous window, and talking about kids, gardens, books and kayaks. Fran dropped us back into town just in time to be handed a glass of champagne on the ferry to MONA. The thing about MONA is the weird way the building has no real external image. It’s kind of like there is no there, there. 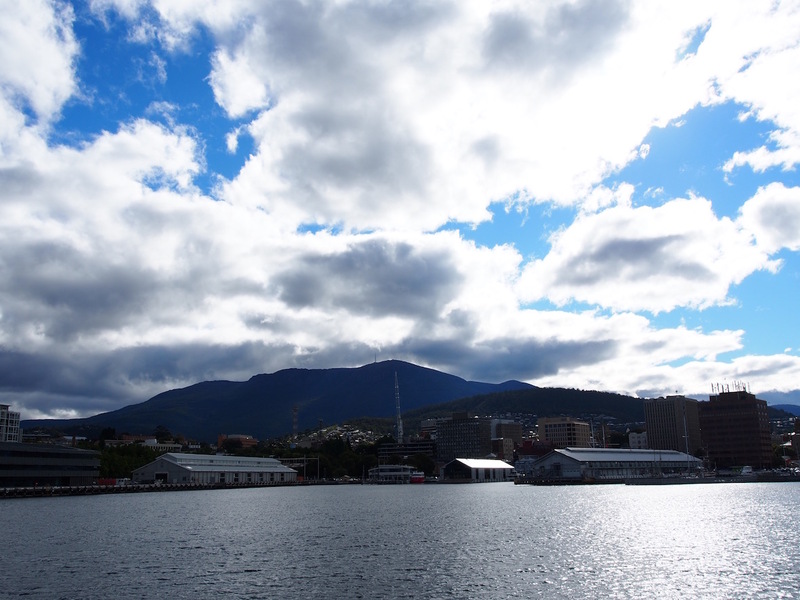 The building is mostly below ground, built into a headland overlooking the Derwent River. It only emerges in a few seeming unrelated structures to let in light or to provide access. As such it is a hard place to get a sense of from the outside, which explains why all the visual images used to promote MONA are of the internal spaces or of the collection. It might be the landscape architect in me but I quite like this approach to designing such a significant building. Making it more of a place than a thing, but it does take a while to get used to. Inside, the galleries are arranged vertically, dug into the raw sandstone of the headland. The accepted approach seems to be to dive in, heading down as far as you can go and then work your way back to the surface, by which time you will be gasping for some refreshments and of course, needing to buy some postcards. 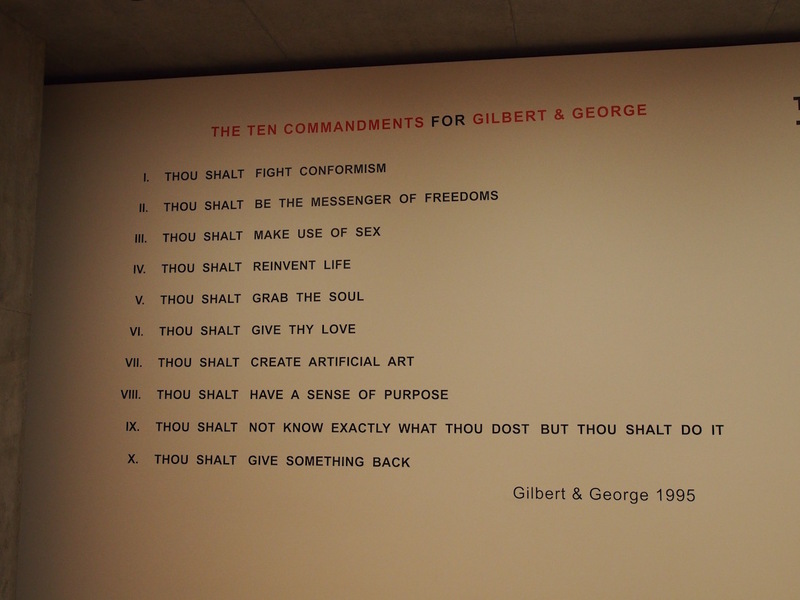 The big exhibition at MONA was a George and Gilbert retrospective. Before this exhibition my only knowledge of these two was of their pudgy, be-suited personas, when occasionally appearing on television. Their art though, is amazing. Terrific graphic styles and motifs. I loved it. They kind of reminded me of a pommy, and slightly more politically focussed version of our very own Mambo artists. We spent most of the day at the museum exploring all the galleries and having lunch on a grassy terrace overlooking the river. It was a Saturday and the gallery was quite busy but it didn’t detract from our appreciation of the place. 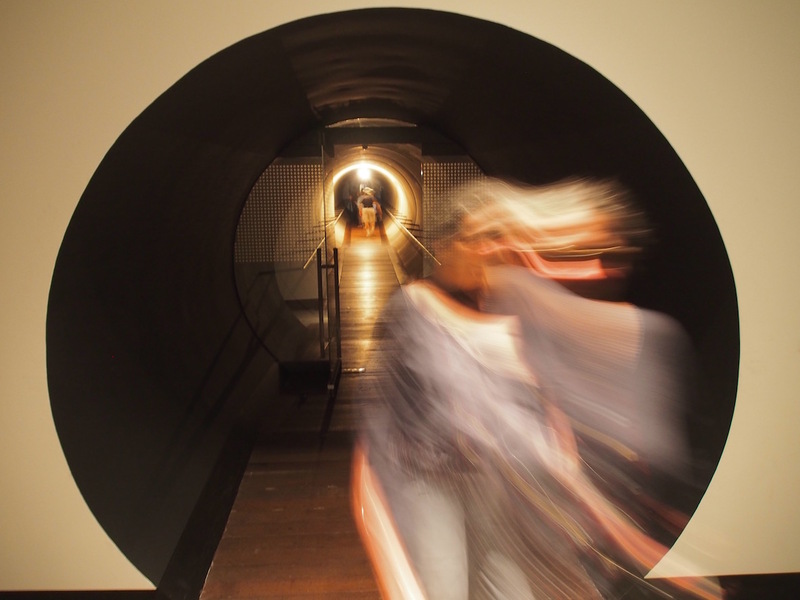 One of my other favourite works was a long tunnel with a sound sculpture that responds to movement. I was lucky enough to go through the tunnel on my own and get the full effect of the sounds building and bouncing around as I moved along. When there are more people in it, the clarity of the effect gets a bit lost. After our big day out we had a little lie down in our hotel before dinner at Aloft. It is a fairly new restaurant and we were only able to get a booking for 8:30 which is a bit late for us, especially after a big day out arting about. Still, anniversary and all that, have to put in. We were pretty hungry when we arrived back to the same new pier the ferry to MONA had left from earlier in the day. The restaurant is in a lovely space, upstairs at the end of the pier, with big windows looking out onto the harbour. Our waitress was young and charming, providing lots of useful information on the options. We decided on the banquet as it meant that we had fewer choices to make. 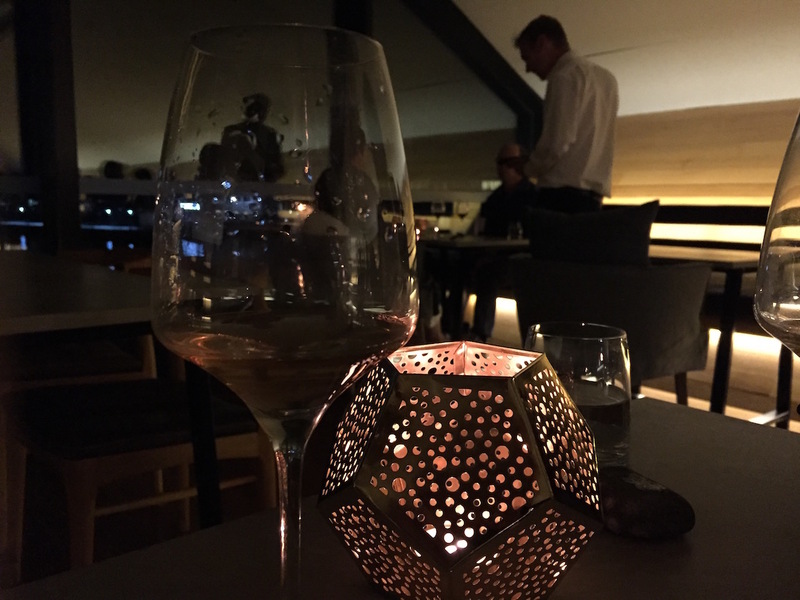 Strop was keen to try an orange wine and the sommelier was very helpful, suggesting wines to go with the various dishes. The food is very high concept, concentrating on the quality of the mainly local ingredients rather than on stunt presentations. We started out with a water egg custard thing and crunchy pigs ears. As we ate, the room started to thin out, the earlier sittings heading off home or to shows. Most of the food was great, but I did find some of it too salty. Particularly the lamb, it was probably a 1 out of 5 on Deb’s salt scale. Apart from the salt issues, things were going swimmingly until 10 pm, when things suddenly started going pear-shaped. Our waitress must have finished her shift because she suddenly appeared with a jacket over her work clothes and sat at a nearby table to have a glass of wine with the couple dining there. Unusual, but kind of charming. Then groups of people started arriving and sitting up at the bar, chatting to the kitchen and floor staff. This all coincided with us being forgotten – as if we had just dropped off the radar. Whoever was supposed to take over from our waitress mustn’t have been able to see us because our water glasses were left empty, to the point that Strop had to actually wave her glass in the air to get a refill. By this time the other tables were thinning out, and it seemed like the staff just wanted to get away and chat with their friends. It was very odd. Luckily, the dessert was excellent. Strawberries and blueberries in a fennel sauce with goat curd sorbet. Yummo. Then we were presented with the wrong bill. 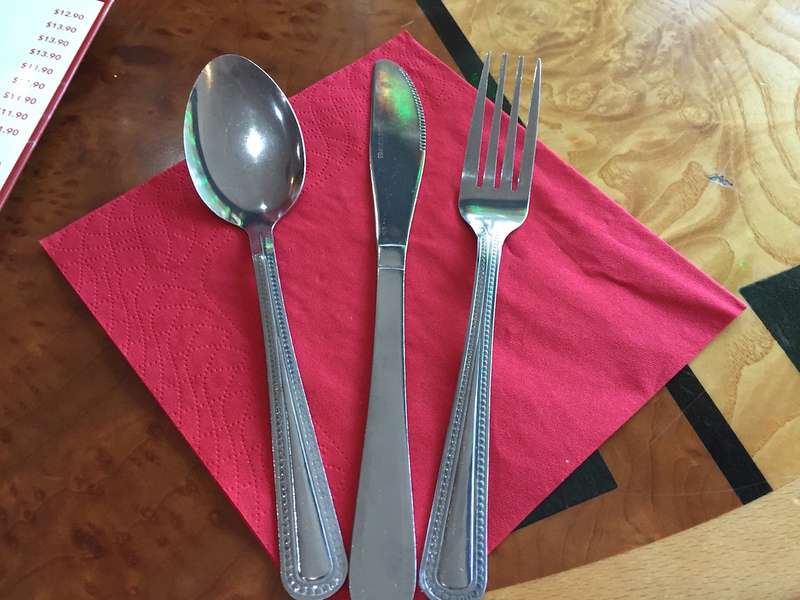 The waiter came back with the right one, and he did apologise but… There was a sense that the staff just wanted to hang out with their mates rather than look after their customers. None of it was horrible, it was just a bit of a surprise, and a contrast to the service earlier in the evening. It was definitely at odds with the image they present, as a high-end restaurant. Maybe it’s just a small town thing, a function of everybody knowing everybody else. Our departure, after paying the correct bill, went un-noticed by the staff. On a more positive note, the access is excellent – 5 out of 5 Susans. The Wendy value scale is a bit more problematic. 3 Wendys, maybe. 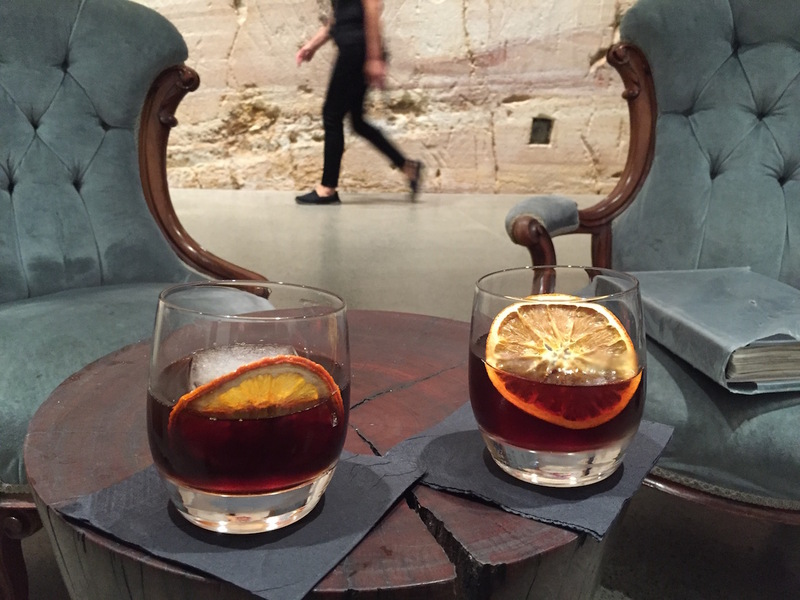 So, have you been to MONA yet?